Middle-Market Finance Theory in Practice. 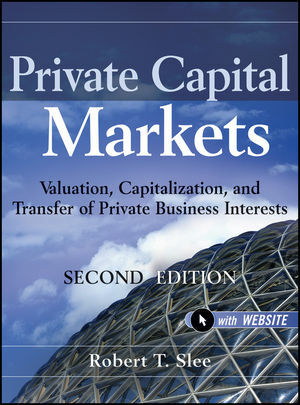 Chapter 3 Private Business Valuation: Introduction. Private Investor Expectations Drive Private Valuation. Private Business Valuation Can Be Viewed through Value Worlds. Valuation as a Range Concept. Chapter 5 Asset Subworld of Market Value. Steps to Derive Net Asset Value. Chapter 6 Financial Subworld of Market Value. Chapter 7 Synergy Subworld of Market Value. Chapter 8 Fair Market Value. Key Steps to Derive Fair Market Value. Does the Fair Market Value Process Make Sense? Tearing Down the Build-Up Models. Chapter 10 Incremental Business Value. Nature of Incremental Business Value. Problems with Using Traditional Methods. Private Cost of Capital Model. Problems with Incremental Business Value. Incremental Business Value versus Market Value. Chapter 12 FASB Value Worlds. FASB Fair Value (ASC 820, formerly FAS 157). Business Combinations (ASC 805, formerly FAS 141R). Chapter 13 Intangible Asset Value. Chapter 14 Other Value Worlds . Chapter 15 Private Business Valuation: Conclusion. Private Business Valuation is a Range Concept. Chapter 16 Capital Structure: Introduction. Pepperdine Private Capital Market Line. Key Issues Regarding the Pepperdine Private Capital Market Line. How Banks Deal With Covenant Violations. Chapter 18 Government Lending Programs. Business and Industry Loan Program. Certified Development Company 504 Loan Program. Comparison of Leasing and Purchasing. Chapter 23 Owners, Angels, and Venture Capitalists. Stages of Private Equity Investor Involvement. Chapter 25 Capital Structure: Conclusion. Capital Providers Manage Risk and Return in Their Portfolios. The Pepperdine Private Capital Market Line Comprises Expected Returns. Private Cost of Capital Emanates from the Private Capital Markets. High Cost of Capital Limits Private Company Value Creation. Intermediation Is Relatively Ineffective in the Middle Market. Chapter 26 Business Transfer: Introduction. Public Manager and Owner Motives. Private Business Ownership Transfer Spectrum. Going Public, Going Private Transfer Channel. Chapter 27 Employee Stock Ownership Plans. Differences between Management Buyouts and Management Buyins. Points to Consider for CRTs. Points to Consider for CLTs. Comparison of CRTs and CLTs. Comparison of Family Transfer Methods. Role of Insurance in Family Transfers. When No Buy/Sell Agreement Exists. Chapter 32 Outside Transfers: Retire. Chapter 33 Outside Transfers: Continue. Buy and Build or Recapitalizations. Chapter 34 Going Public, Going Private. Going Public Key Points to Consider. Going Public on Foreign Exchanges. Going Private Key Points to Consider. Chapter 35 Business Transfer: Conclusion. Segmented Transfer Activity and Arbitrage. Owner Motives Choose the Range of Values. Creating Value in a Private Business Requires Planning. What We Do Not Know. Appendix A Corporate Finance Theory: Application to Private Capital Markets. Appendix B Principle of Substitution www.wiley.com//go/privatecapital. Appendix C IBA Standards: Business Appraisals Standards www.wiley.com//go/privatecapital. Appendix D Private Equity Securities www.wiley.com//go/privatecapital. Appendix E Sample Preferred Stock Offering Term Sheet www.wiley.com//go/privatecapital. Appendix F Private Placements www.wiley.com//go/privatecapital. Appendix G Sample Management Buyout Letter of Intent www.wiley.com//go.privatecapital.